We really enjoyed our stay at Foleys. The room was very comfortable and the central location with secure parking was a real bonus. Above all we valued the kindness and warmth of the reception staff however, who couldn't have done more to look after one of our party who wasn't well - even offering to go and pick up some emergency laundry for her while the rest of us were out. If I had to be picky, I'd say service at breakfast could have been better but we'd definitely go back and recommend it to our friends too. Perfect!!! Lovely!!! In city center, great accomadations, friendly staff, off street parking, wonderful breakfast. I had a delightful experience. Fantastic location within walking distance of so much, easy to find, delicious breakfast, and had everything I needed. However the best part was the kind service I received from the lady at the front desk. She was genuine, made me feel welcome and taken care of. I enjoyed chatting with her. Exellent stay! Very close to everything we wanted to see, and easy to get to! We had an excellent stay and enjoyed great hospitality from very friendly staff. Our room was well above average in many respects and the food including a meal whad in the restaurant was excellent. Care was taken to satisfy dietary requirements. Foleys was recommended to us by the local riding stable, and I'm glad they did! This was a great place to stay, in town location right on the Main Street was amazing!! Staff was lovely as was room. On site parking was a fantastic added bonus! Would absolutely stay here again! Thank you! this is a very pleasant hotel well located in Killarney. It has generous parking, a fine restaurant and decent bar. The employees are very helpful. Despite having a room on the street the weekend Kerry won the all Ireland I had no problem sleeping. The breakfasts are fine and although the bar doesn't open until 5 it is comfortable and quiet. An excellent experience. Rooms clean and beautifully decorated. Both breakfasts and evening dining a pleasure. The rack of lamb was to die for! The staff were efficient and very friendly, nothing was too much trouble. I would thoroughly recommend Foleys and hope to return. Loved our stay. Convenient location and parking, good restaurant and air conditioning. Would definitely recommend. Foleys Guesthouse is ideally located - within walking distance of shops and all attractions within the town. Room was spotlessly clean and staff were very helpful. Would definitely recommend this Guest House . Foleys is a fantastic B&B in the best location right in the heart of the town, it is very clean and neat the breakfast was excellent, if you want a central location, Clean, bright and cosy Stay here. I love the location and that the hotel is decorated in a traditional style, with splashed of modern thing. When I go to Ireland I want to stay in charming places and Foleys is very charming. What a beautiful downtown guesthouse. Right in the heart of Killarney and within walking distance of all that the town offers. If we were not on a tight schedule, we would have stayed longer. The facility was beautiful with off street parking. The room was quiet, spacious, and comfortable. The whole staff was outstanding, friendly and always available. Our desk clerk, Moira, was our "personal" concierge as well as a professional who took her job seriously and made our stay extraordinary. We will return here on our next trip to Ireland. Everything perfect but a bit expensive. We recommend it if you are well off. We loved our stay at Foleys, during the heat wave it was the only hotel that had air conditioning, a big plus! To comment on the other person's note on the key, we did not have to leave it there, but it was too big to carry around with you, heavy too. Maybe they should re-do the key thing. The rooms was lovely, very clean the food was very good, Joe at the front desk and bar was friendly, accomodating, very good. We will go back there again, also because it is within walking distance to all the shops and pubs. A very nice place to stay. Everything was ok, but main grievance is that you have to leave the key at the reception desk. And every time I returned I had to wait or track down the receptionist who plays double duty in the restaurant. Also I room had been left unlocked by the house keeping. Overall my stay was fine, but next time in Kilarney I'll definitely be look at other accommodations. Having visited many towns in Ireland over a twenty year period I found this gem of a hotel. The rooms were immaculate, the restaurant first class and the staff couldn't have been nicer. Foley's was the perfect spot for a family weekend away. We were a family of 10 inc. 2 children. We had a street facing room which was surprisingly quiet. I woke to the sound of a small group of revellers chatting, and later to the sound of the refuse truck very efficient - I would have expected more noise being right above the main street. It was perfectly placed in the centre of town - half of our party was leaving early Saturday to do the Skellig Michael trip so very worth doing, but as that is very weather dependent and the other half of our party was not doing it - we needed a location that would entertain us in the event we couldn't go. We also wanted to put the cars away for the weekend. Parking was very convenient, and the guesthouse itself was very easy to find. A real treat on the night before the Skellig trip was to find a beautiful photography gallery a few doors down, with a huge picture of Skellig Michael that scared the bejasus out of us. We returned to this shop a few more times after the trip was done. Foley's is one of two restaurants in Killarney that is very highly rated. I didn't know this when I booked it. I ordered a birthday cake and the set menu for that Saturday night. This meal was fantastic. Every part of it was super. One in our party has very high standards when it comes to food, and even they were delighted with this. Thank God. Carol - the owner came and had a lovely chat with us. We all felt that we wanted her to sit and just be one of our party for the evening, a really lovely lady and so interesting. She obviously has a love for her business, and is very good at what she does. We will be back again. That is a given. I wouldn't bother trying to book with any other for any forthcoming trip to killarney. This place cannot be faulted. The rooms were of the highest standard and the staff could not be more pleasant and helpful. Full marks and excellent value. Foleys Townhouse was absolutely fantastic. The reception we received when we arrived was lovely. The room was perfect and so clean. The food was lovely and the staff couldn't do enough for you. I would definitely book another stay at Foley's and i would recommended it to family and friends. Foley's was a great place to stay in Killarney. It's located right on the main street, but the room was very quiet. The location is walking distance to anything downtown and has plenty of tour groups that can pick you up for Ring of Kerry/Dingle day excursions. If you have a vehicle, they have a huge parking lot in the back and the entrance is gated for safety and security. Our room was large with a queen bed, a jacuzzi tub and a small sitting area. Everything was very clean and cozy. We had dinner downstairs at the restaurant and it was fantastic I had a stuffed lobster in a cream sauce and my husband had a steak. The breakfast in the morning offered a variety of continental items or a hot, traditional Irish breakfast. All delicious! The team was very friendly and accommodating to our needs. I would recommend this hotel to any age group. Couldn't have been better. would stay there again. 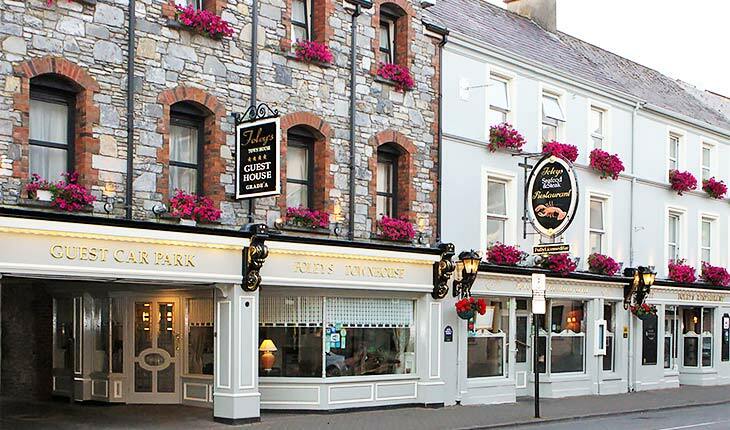 We spent 4 nights at Foleys Townhouse and found it to be the best location in Killarney. The staff is very nice and always willing to help. I would reccomend Foleys to anyone that wanted to spend their vacationin Killarney. 5 stars. A beautful house, the rooms are amazing, and we will return, if your looking for comfort this is the place to go, and we will return. Great place with parking right on a main street. Restaurant had good food.